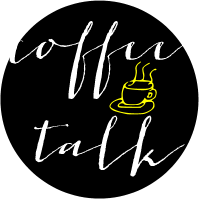 Linking up again with Natalie at 23Seventeen for a little Coffee Talk! Happy Thursday...almost Friday...Yeaaaaaa!!! I drink it...in my typical bowl tipping fashion! You can't waste that stuff! My favorites are Honey Nut Cheerio flavored milk, and Cinnamon Toast Crunch flavored milk. I'd probably buy it that way if they sold it! But I DO!!! I love sharing food...Stephen and I often go "halvesies"! It's the best especially when you can't decide on what to order...a dilemma I often have! Every 2-3 months, I hope this is okay...and not that I'm gross. Usually that is about when it starts to get funky anyway! If it is straight every other day, but if it's curly every day. Dishwasher....sponges are nasty! If I ever wash them by hand though, I use a TON of paper towels! I don't think I've ever used paper towels while washing dishes. I think one of us is doing it wrong, LOL. Also jsyk vanilla almond milk tastes just like leftover cereal milk, it's basically amazing. This made me realize I need to replace my toothbrush, haha, thanks! Have you ever tried horchata? I think you'd like it. Found your blog through the link up! mmmmm cinnamon toast crunch. crap. now i want some!! This is great! I use paper towels religiously when I handwash dishes. I'm glad I'm not the only one out there that does this :). Oh Joey! Love him always will lol. Nice tidbits here. I totally disagree with Sammantha though, Vanilla Almond Milk totally doesn't taste like cereal milk! lol. 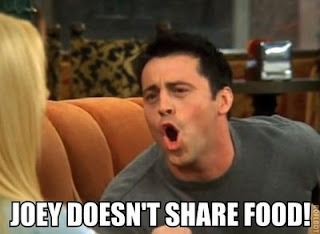 BAHAHAHA JOEY! I love Friends. There really will never be a show like it.